A Staff Scientist at USRA's Lunar and Planetary Institute in Houston, Dr. Graham Ryder was a premier lunar scientist who pioneered many of our most important concepts about the Moon and its evolution. Dr. Ryder received his B.Sc. from the University of Wales (Swansea) in 1970 and his Ph.D. from Michigan State University in 1974, specializing in the petrology of igneous rocks. He did post-doctoral study with John Wood's group at the Smithsonian Astrophysical Observatory, and was employed by Northrup Services Inc. in the Lunar Curatorial Facility at NASA Johnson Space Center prior to joining the LPI. His work was instrumental in several areas of lunar science. He was among the first to recognize evidence in the lunar sample collection that mare volcanism began very early, before the end of the "late heavy bombardment." 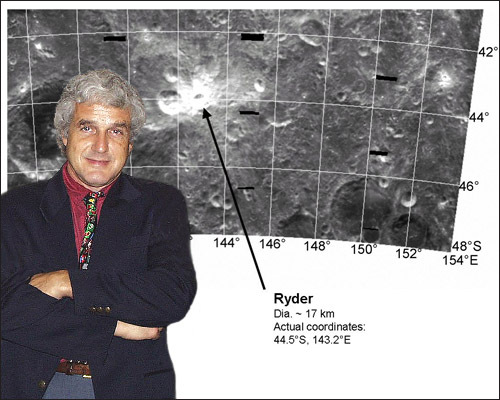 Thanks to the efforts of Dr. Paul Spudis, a crater on the Moon has now been named after Dr. Ryder, who passed away on January 5, 2002, as a result of complications from cancer of the esophagus. He was only 52 years old. Ryder Crater is located at 44.5°S, 143.2°E. The name was formally approved at the IAU General Assembly in August 2006.